You won’t be surprised to learn that McKinsey is a highly selective consulting firm, perhaps not the most selective if we compare to some strategy consulting boutiques but let’s say that the reputation of high standards is fully true here. 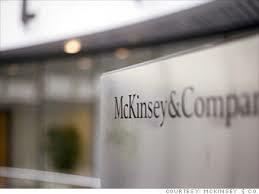 Is McKinsey the most selective firm of consulting market? This is not obvious. We must indeed consider the volume effect and the effect of the quality of candidates. The quality of candidates at McKinsey is, undoubtedly, among the highest in the world. However, the volume of recruitment is also important at McKinsey, in a continuous mode. But what are the profiles that interest McKinsey? The firm provides some answers here. Then you have to distinguish whether your career plan is limited to France, or if it is open to international firms. McKinsey in France is open to the largest business and engineering schools. Obviously, it comes down to what we call Group A schools, which is equivalent to top US Universities. Over time, the recruitment opened gradually in France, also. But the majority of recruitment for junior positions concerns elite institutions. The good news is that recruitment in the second half of one’s career, I mean after two or three or up to five years of professional experience, is also a key recruitment channel for the firm. This opening of the consulting sector results in increased opportunities for more varied profiles in consulting. That said, it does not change anything with the selectivity of the interviews. It only helps give a growing number of candidates the opportunity to demonstrate their skills by being invited for an interview. If you are aiming for an international career, especially in the United States, the competition is a little subtler. Obviously, the heart of the target consists of large American MBAs and universities, such as Harvard, Stanford, Wharton… but not only. In any case, it should be understood that any single degree is not a guarantee of being invited to McKinsey. In the U.S., for example, it is customary to say that coming from Harvard is not sufficient to joining McKinsey. In general, and this also applies to this office, working on your professional network is an excellent practice. You must also prepare your resume and your cover letter with the highest standards of requirement and train to achieve the level of standards required by McKinsey. Some simple advice: do not delay before preparing your application. The most time-consuming part of all concerns work on your professional network. It is good to take the lead and begin to situate yourself in relation to the firm approximately six months before the recruitment deadline. Ultimately, less than 10% of the applications received end-up in interviews at McKinsey. But believe me, it is possible to make these figures lie and turn them to your advantage, I explain how in detail in the Consulting Case Revolution training.